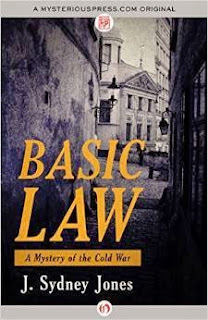 Basic Law by J. Sydney Jones is a 2015 Mysterious Press publication. I was provided a copy of this book by the publisher and Netgalley in exchange for an honest review. Sam Kramer is shocked to learn a former lover, “Red Reni” has committed suicide. He is even more puzzled when she names him the executor of her literary estate. When he begins looking for Reni's memoirs, he discovers they are missing, and when another death occurs, it makes him wonder if Reni really committed suicide or was murdered. Could one of the old friends and political radicals that were once so close, and so idealistic, who dubbed themselves “The Magnificent Seven”, during the late sixties and seventies be responsible? This is an interesting and unique mystery, with a old fashioned detective feel to it, as Kramer and his buddy,hit the pavement in order to look into the mysterious death of their old friend and reacquaint themselves with the old gang in search of Reni's memoirs. The gang waxes nostalgia, like people attending a high school reunion, but all of them on edge as they fear their present day lives could fall apart if Reni's tell all journals ever see the light of day. So, you can see how the suspense begins to build, giving the book a taut edge. However, despite all that, the book is understated in many ways, moved at an excruciatingly slow pace at times, and for some reason I kept feeling like I had walked into the middle of the play, because I could never get a feel for what this group was into back in the cold war era. It's all rather vague and shadowy, which might have been the author's intent.